The 2-wire Video Intercom System requires only two wires connected to each monitor, providing power, voice and video viewing between the monitors and lobby panel. Our MT Series Video Intercom System offers single button press call buttons that visitors can use to ring to a single tenant in a multifamily apartment building. 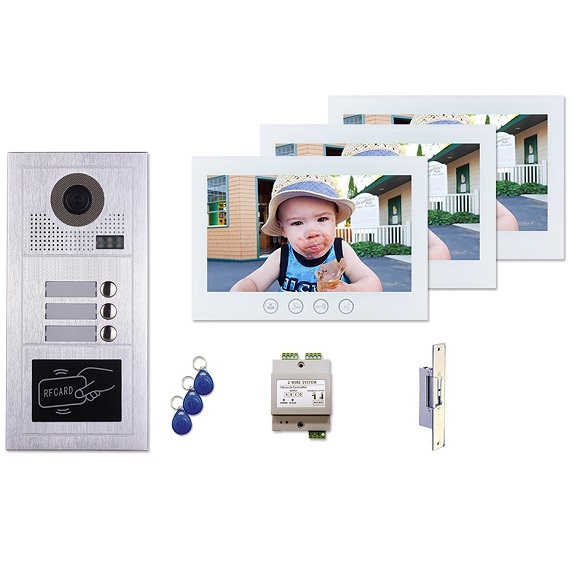 Video monitor viewing offers a secure way for residents to identify their visitors before granting them access directly from the indoor color monitor. Two-way voice communication is also included to allow tenants to communicate with visitors and let them know whether or not it is a good time to enter. Our camera door station lobby panels are complete with night vision to ensure 24/7 security to residents in the apartment building. Most areas now require a building entry system -- so why not choose the safest option by installing a 2-wire Video Intercom System.